Phuket (Thailand) – January 4, 2018 (travelindex) — Best Western Hotels and Resorts organized an exclusive media familiarization trip to Phuket this month, inviting a series of influential and up-and-coming bloggers to the island for an action-packed three-day itinerary. Two famous bloggers and one journalist from Travel & Lifestyle’s publications, plus the winners of a Facebook Live contest organized by KTC and Chillpainai, were invited to Phuket from December 14-16, 2017. They were joined by members of Best Western Asia’s marketing team. 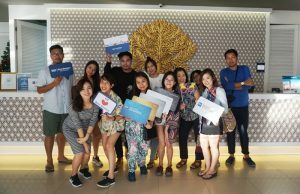 Staying at two hotels, the media delegates were able to experience Best Western’s different and distinct products in Phuket. Best Western Patong Beach is a modern midscale city hotel located in the main tourist hub of Patong, while Best Western Premier Bangtao Beach Resort & Spa provides an upscale beach resort experience on the island’s idyllic west coast. Activities on the fam trip itinerary included a tour of Phuket Town, with its classical Sino-Portuguese architecture, local food tasting sessions and a trip to Mai Ton Island, an exquisite tropical paradise located just off Phuket’s east coast. The media delegates were also provided with an introduction to Best Western Rewards®, the company’s award-winning guest loyalty program. “Phuket is one of the world’s most popular resort destinations, attracting an ever-increasing number of domestic and international visitors to its pristine shores every year. But there is more to Phuket than just sun, sea and sand; our immersive fam trip was designed to introduce our media friends to the cultural experiences that make Phuket such a fascination destination,” said Olivier Berrivin, Best Western’s Managing Director of International Operations — Asia. “Best Western offers an excellent choice of hotels in Phuket which are suitable for all types of traveler, from couples seeking a romantic beachfront break to groups of friends and families who want to be in the heart of the action. This media fam trip will help to spread the word about this enchanting island and the many activities and attractions it has to offer visitors,” Olivier added. The fam trip forms part of Best Western’s continued efforts to engage with the media and travel trade in Asia, for the benefit of the entire travel industry. Journalists, bloggers and other members of the media who wish to experience Best Western’s hotels and resorts in Asia can contact us at Marketing Communications Department Tel: +66 2 656 1260 or sirimanas.maungrod@bestwestern.com and orapan.sornnuwat@bestwestern.com. Best Western Hotels & Resorts headquartered in Phoenix, Arizona, is a privately held hotel brand with a global network of 4,200* hotels in more than 100* countries and territories worldwide. Best Western offers 11 hotel brands to suit the needs of developers and guests in every market: Best Western®, Best Western Plus®, Best Western Premier®, V?b®, GL?®, Executive Residency by Best Western®, BW Premier Collection®, and BW Signature CollectionSM by Best Western; as well as its recently launched franchise offerings: SureStay® Hotel by Best Western, SureStay Plus® Hotel by Best Western and SureStay CollectionSM by Best Western. Now celebrating more than 70 years of hospitality, Best Western provides its hoteliers with global operational, sales and marketing support, and award-winning online and mobile booking capabilities. Best Western continues to set industry records regarding awards and accolades, including 64 percent of the brand’s North American hotels earning a TripAdvisor® Certificate of Excellence award in 2017, Business Travel News® ranking Best Western Plus and Best Western number one in upper-mid-price and mid-price hotel brands, and Best Western receiving seven consecutive Dynatrace® Best of the Web awards for its leading hotel website. Best Western has also won nine consecutive AAA®/CAA® Lodging Partner of the Year awards, recognizing the brand’s commitment to providing exceptional service and great value to AAA/CAA’s nearly 58 million members in the U.S. and Canada. Best Western-branded hotels were top ranked in J.D. Power’s 2017 North America Hotel Guest Satisfaction Index Study – ranking first in breakfast (food and beverage category) for midscale; and second in overall guest satisfaction. Over 32 million travelers are members of the brand’s award-winning loyalty program Best Western Rewards®, one of the few programs in which members earn points that never expire and can be redeemed at any Best Western hotel worldwide. Best Western’s partnerships with AAA/CAA and Harley-Davidson® provide travelers with exciting ways to interact with the brand. Through its partnership with Google® Street View, Best Western is the first major company of its size and scale to launch a virtual reality experience for customers, setting a new industry standard and reinventing how guests view hotels. — All Best Western and SureStay-branded hotels are independently owned and operated. — Numbers are approximate, may fluctuate, and include hotels currently in the development pipeline.